Astronomy Picture of The Day (APOD) is an awesome free app we want to bring to your attention. As its name indicates, the app, developed in partnership with NASA, features a huge library of high resolution NASA space photos that you can use with your students to teach them about outer space. Each day, APOD features a stunning image of the universe accompanied by a detailed description. You can easily add these pictures to your favourite list for later reference. Or, you can share them with others through social media websites such as Facebook and Twitter. APOD pictures are selected by NASA astronomers. ‘ Jump to photos by date, save them to your photo roll or share them friends. Want that latest Hubble photo as a background? Then APOD is for you.’ With the newly released update, APOD becomes available for Apple watch allowing users to browse and view space photos anywhere they are with Internet connection. 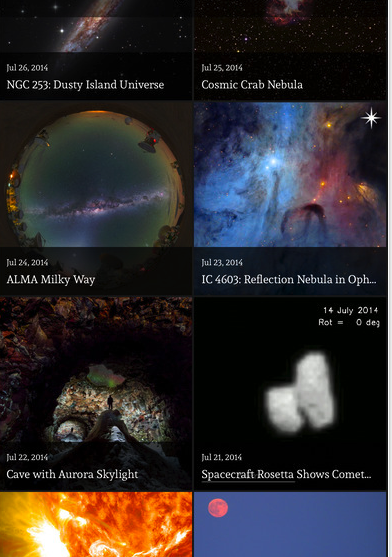 APOD is also available for Android users.